Ulster scrumhalf John Cooney admitted facing Leinster in a European Champions Cup tie does bring extra motivation. The Irish provinces meet for only the second time in the knockout stages of Europe when they face-off at the Aviva Stadium in a quarter-final tie on Saturday (kick-off 5:45pm). The last time they met was in the 2012 final, when Cooney picked up a winner’s medal as Leinster crushed Ulster 42-14 at Twickenham. “I made my European debut in the final,” recalled Cooney, who was to move to Connacht before coming North to Ulster two seasons ago. “I didn’t feel that much a part of it as I hadn’t played much. I only played the final. “It was brilliant and amazing to do but I definitely feel a much bigger part of this Ulster team. “I’ve developed a lot since then. Three shoulder injuries since then, I’ve taken the positives out of those set-backs and they’ve done me good. “I think I’ve adapted how I play and I’ve improved as a person. I’ve come a long way since then,” he added. Cooney admitted facing Leinster in such a big occasion brought extra motivation. “I’d be lying if I said it didn’t matter. It adds that extra bit of fire in the belly,” he said. “When you’re struggling, fatigued in a game, that’s where you find that extra level. I’ve only played them a few times. “I’ve played Connacht (more) and came out of those games battered. It does add that fire in the belly, even for the lads that are playing against Leinster, and I’m sure they’d say the same thing, but I think it’s a positive thing in the energy you can provide. “It’s important to bring that into the team,” he added. 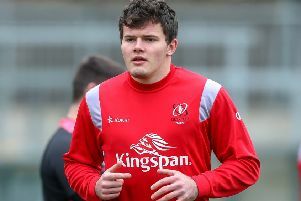 After Captain’s Run yesterday in the Aviva, Cooney said the mood in the Ulster camp was good. “I think it’s really positive. Everyone was joking away on the bus up and everyone’s very excited. Leinster are without key figure and captain Jonathan Sexton, but Cooney said it had not changed Ulster’s approach. “I think it’s like anything. We prepare for any outcome. They’ve Ross Byrne to come in, they’ve Noel Reid on the bench who is a 10/12. Cooney revealed has never kicked a goal at the Aviva in spite of being involved with Ireland in the Six Nations. “It was one of my goals in that, but hopefully I will get the chance tomorrow,” he smiled.